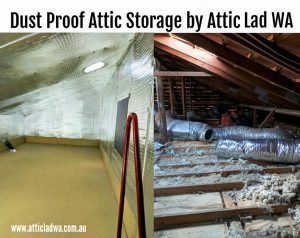 Attic storage can be the perfect way to create more storage in your Perth home; whether you are looking to create some basic storage or a fully enclosed dust proof attic room, A professional conversion can add real value to your Perth home. Typically, there are two options when it comes to roof storage. The first option is basic attic storage. 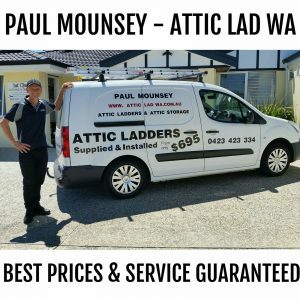 My prices for a 12sq meter basic attic storage platform and a deluxe wooden attic ladder start at $1600 fully installed. This is often the cheapest solution. The second option is a fully enclosed dust proof attic storage room. This is created within the existing roof space. A Turbobeam whirlybird will be included which will provide ventilation and natural light. This is the best solution if you want to store your belongings in a dust free environment. 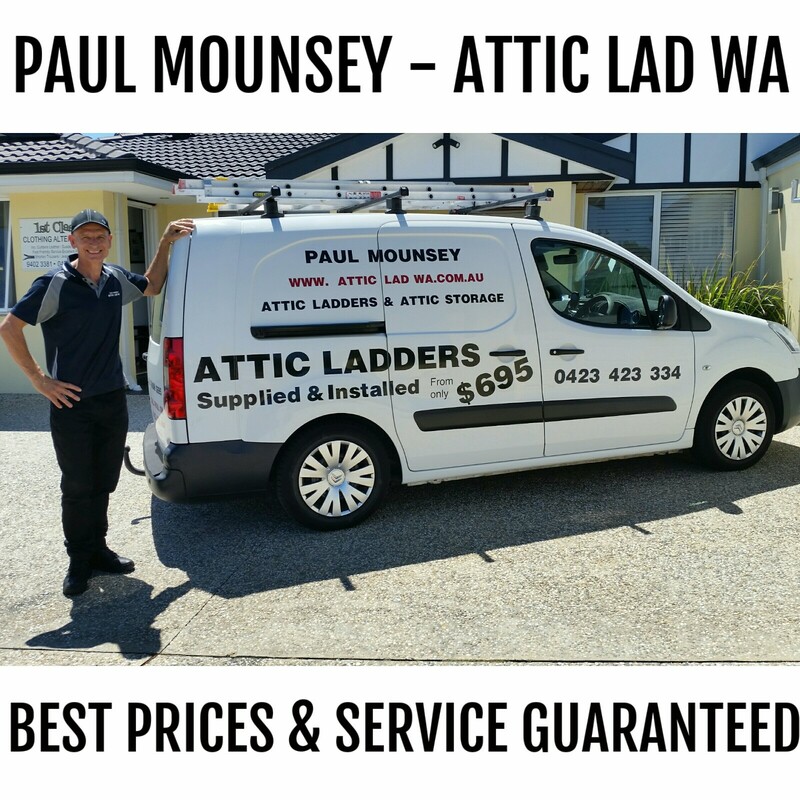 My prices start at $4200 for a 10sq meter dust proof attic room and a deluxe wooden attic ladder. Coupled with the fact that you don’t need to lose the garden space that you would for a typical shed ,attic storage installations do not require planning permission. As long as the proposed storage space is used for storage only. Before you make any decisions on the type of roof storage that is most suitable for you, think about what your requirements are for the new space; what will it be used for? Do you need it to be a dust proof attic storage room or a basic storage platform , How much space do you need for it to function properly? Once you have a list of your requirements, please feel free to contact me for a no obligation free quote. In general, the rules for a new attic storage conversion are not complicated. Before the install I will check it meets the basic requirements for things such as structure, ventilation, safety. You can be assured the work will be carried to a high standard. When it comes to accessing your attic a good, safe and sturdy ladder is a must-have. Ensuring a safe and easy access, attic ladders can help in transforming your home, creating more space. 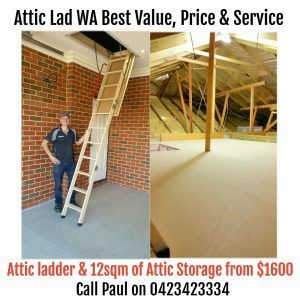 Having a attic ladder installed by Attic Lad WA will give you easy and safe access to your attic storage space. There are few key points to consider when looking for the best attic ladder. Cost plays a big part, that’s why I stock a wide range to suit every ones budget. My prices start at just $695 for the budget attic ladder fully installed. Next is my deluxe wooden ladder which can be installed from $795. 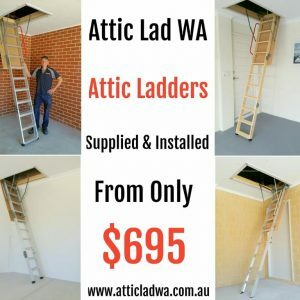 If you have a slightly larger budget, you could decide to go the deluxe aluminium attic ladder which is $895 If you want the best , My Grand Wooden Attic Ladder becomes your best option. Another Happy Attic Storage Customer !